Asparagus Pea (also Winged bean) Plant in garden. Beetroot (also Beets)	Plant in garden. Chilli (also Hot peppers) Plant in garden. Chives (also Garden chives)	Plant in garden. Climbing beans (also Pole beans, Runner beans, Scarlet Runners)	Plant in garden. Eggplant (also Aubergine) Plant in garden. Florence Fennel (also Finocchio) Plant out (transplant) seedlings. French tarragon	Plant in garden. Mint (also Garden mint) Plant in garden. Rocket (also Arugula/Rucola) Plant in garden. Rockmelon (also Canteloupe) Plant in garden. Sage (also Common Sage)	Plant in garden. Summer savory (also 'Bean Herb')	Plant in garden. Sweet Potato/Kumara	Plant in garden. Thyme (also Common thyme) Plant in garden. Yacon (also Sunroot)	Plant in garden. Yam/Oka (also Oca)	Plant in garden. Thanks so much for taking the time to write-up these "what to plant" posts, they seem like they will be an amazing future resource for me. Quick question: Do your growing recommendations in these "[month]: What to plant" posts apply to the Redding area as well? Looking forward to your answer and keep up the great work here! First, my apologies for not writing sooner. My parents were both in and out of hospitals since the end of January. My dad died just a few weeks ago and I'm finally getting back into some of my "normal" things! As for Redding being in the same zone... I'm honestly not sure but I would guess we have much of the same type of climate. I use a combination of zones 8a and 9b to cover the "Northern CA and Central Valley" areas ... both zones have similar if not exactly the same planting schedules. I would think you could plant the same things, just be sure to watch your watering and shading... if the plants seem to be struggling then a bit of shade in the hottest part of the day might help, and a bit more water may keep them going. Bump! PNG_Grandma, thanks for posting this last year! @PNG_Grandma wrote: Wow...I'm a day early!! Climbing beans (also Pole beans, Runner beans, Scarlet Runners) Plant in garden. French tarragon Plant in garden. Sage (also Common Sage) Plant in garden. Summer savory (also 'Bean Herb') Plant in garden. Yacon (also Sunroot) Plant in garden. Yam/Oka (also Oca) Plant in garden. March is upon us! So far, it has been a warmish winter. My orange tree has flower buds, just in time for the last rain period, followed by March-April winds. So far this year, Fresno has received 4.51" of rain, almost 2X last year's total. Not enough to make up for the past drought years, but better than last year which was 2.82" to date. We could use some cold snow pack for spring runoff, but so far, not much to speak of. Both local ski resorts, China Peak and Badger Pass, are closed until there is more snow. Historically, they have been open until close to Easter so this is another sad reference. Time to have the beds ready and mulch on hand. Also, mulch around the bushes, roses, and trees to survive water rationing. Happy gardening! @sanderson wrote: Bump! PNG_Grandma, thanks for posting this last year! Just about to welcome Sandy Moore then noticed it was posted 2013. I used not to have the year printed on post until I updated my profile so it saved me the . DS planted these seeds Feb 1 in the little Gwennifer plastic tub table top we built for him. There were a lot more seeds but the 2 year old mixed up the soil when son's back was turned! Maybe you can see the radishes were seeded 16/square. I didn't need a two year old, the birds did the same to the box I planted in the fall. I found beets growing 4 feet away from where they were planted! Rain to date last year: 3.40". Year to date this year 4.58". Mulch my flower/shrub beds like mad. Ken and I are working on our neighbor's beds. DH picked up 1.5 cubic yards of compost from Gallo Winery to have her gardeners spread in her beds. Next is virgin chips on top of the 2" of compost. The guys are spreading it right now so I went over to check. They are piling it up around the plants! No! I tried to explain to move it away, also away from the fence boards. The boards are already rotting from dirt raked up against them! She is 78 years old with an autoimmune condition that makes it hard for her to do much more than help take care of her son, who has MS and needs assisted care. I realized I didn't plant any zucchini yet!!!! Now I'm thinking I might as well wait until the fear of frost is past and just plant in their spot. What do you think? You have enough seeds, so do both! DH finally set up the used Baker's rack I bought last summer. The borage and zinnias are on the top shelf. Sweetie kept nibbling on the them. This is the south side of the house. That's cute and functional! Mine's pretty ugly and functional, LOL! I cannot find my Zucchini seeds anywhere, I'll have to tear apart my office I'm sure they're hiding in there somewhere. Mary, I don't know about outdoor seeding for peppers and tomatoes. Just not experienced enough to comment. But I would say, what the heck, if the beds are ready and in the sun, put a few seeds in to give it a try. I didn't start my seedlings until February 8, 25 days ago, so I don't think you are too late for a few seed pots indoors under lights. I permanently moved my seedlings outdoors yesterday since the nights are 40*F or higher. Some of my beds don't received enough sun and are still too cold to direct seed. I will be seeding okra, maybe pole beans in their warm beds. @sanderson wrote: Mary, I don't know about outdoor seeding for peppers and tomatoes. Just not experienced enough to comment. But I would say, what the heck, if the beds are ready and in the sun, put a few seeds in to give it a try. I didn't start my seedlings until February 8, 25 days ago, so I don't think you are too late for a few seed pots indoors under lights. 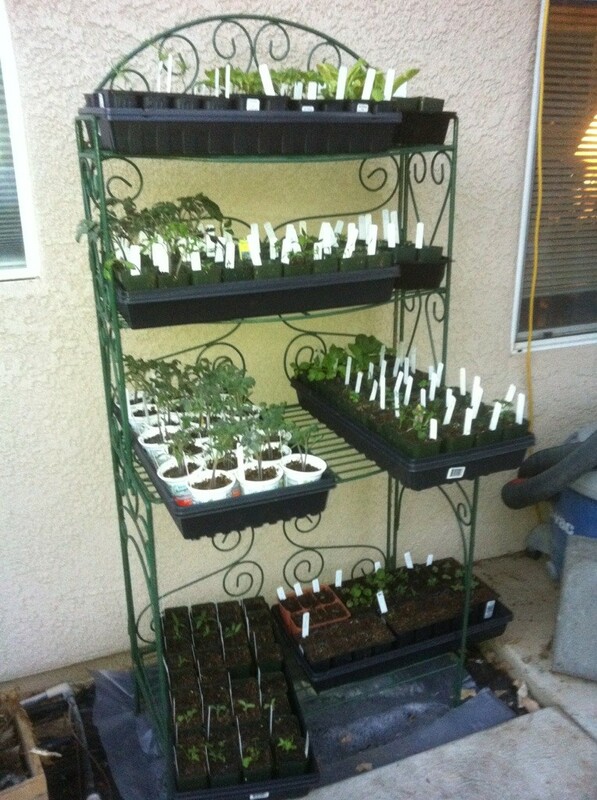 I permanently moved my seedlings outdoors yesterday since the nights are 40*F or higher. Some of my beds don't received enough sun and are still too cold to direct seed. I will be seeding okra, maybe pole beans in their warm beds. I find a very reliable way to determine when to set out plants is to use frost dates. There are calculators out there that do use the frost dates to determine planting dates. One site for calculators is Johnny's Selected Seeds, it's very good. http://www.johnnyseeds.com/e-pdgseedstart.aspx?source=W_InteractiveTools_032014. Don't know your frost dates? A good source for average frost dates is Utah State University. Just put in your state and scroll down to the nearest weather station to your location. Johnny's Selected Seeds also has downloadable spreadsheets to calculate succession planting dates, target harvest dates, and fall planting dates. Very handy. Bmoore, Thanks for the FF/LF link. Our ave last frost is Feb 12, based on 66 years of data. Got 2 squares of Rattlesnake beans planted today. The boxes have 8' trellises. 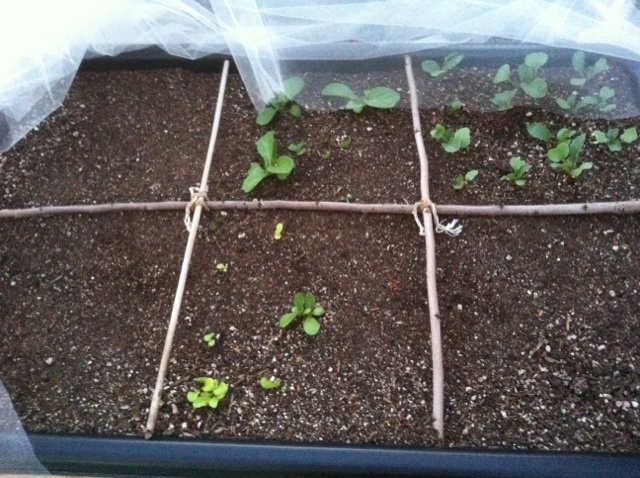 All the February seedlings are outside. Some of the sweet potato slips have inches of roots, others higher from the water were removed and placed in a cup of water to grow a few roots before going into the MM. The orange tree has white flower buds, almost ready to open. This is the month to do it all! We have some rain expected the first half of March but after that, anything goes. I hope to get new compost on the old beds and let the rain thoroughly soak the MM. Since I just started my seeds yesterday, I'm way late starting but hopefully all will be equal by June. This is where the seedlings were last year at this time! It's that time of the year for seedlings. I was really, really late starting them but tonight I noticed little sprouts under the indoor lights. We have had a banner winter regarding rain and snow pack. The rain certainly tested the infrastructure of the State water system. Most of us are out of the last freeze but with rain expected Sunday and possibly a few days more for some areas, like Redding and Sacramento, it may be prudent to hold off setting out the plants. Here is the planting guide for this month. At the Ag Expo, I hit the Master Gardener booth. They had a nice Vegetable Planting Guide for the San Joaquin Valley. I noticed garlic is to be planted Mid Jan - March, harvested May-July. Normally, I plant in the fall and harvest in the late spring. I may just give spring planting a try. Nothing going on for me until next week. We actually have a possibility of snow in the forecast. As usual, I'm getting a late jump on the beds as the weather and life's diversions get in the way of getting some soil under my nails. I miss it! The rains have kept my gardening to a minimum and my compost pile is down to nothing but all of last season's compost- I really fell behind. Just this month, the the corporate water demigod (CalAM) received permission from the state water board to jack up the price of water 25 % -we already are paying a 100% increase levied by the board to offset the corporations' loss of revenue from voluntary cutbacks and state mandated cutbacks. So now we are paying more and using less.... going to be watering my garden with tears! @Yardslave wrote: As usual, I'm getting a late jump on the beds as the weather and life's diversions get in the way of getting some soil under my nails. I miss it! The rains have kept my gardening to a minimum and my compost pile is down to nothing but all of last season's compost- I really fell behind. Just this month, the the corporate water demigod (CalAM) received permission from the state water board to jack up the price of water 25 % -we already are paying a 100% increase levied by the board to offset the corporations' loss of revenue from voluntary cutbacks and state mandated cutbacks. So now we are paying more and using less.... going to be watering my garden with tears! Why?! You guys have been getting record rains!